This easy-to-read thermometer allows you to compare the difference between Fahrenheit and Celsius. Temperature range: -10°F to 120°F and -20°C to 50°C. White plastic backing. 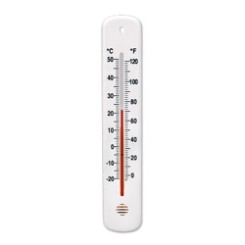 Dimensions are 8½"h x 1½"w.
Pack of 10 Multipurpose Thermometers Jumbo Classroom Thermometer 36" Tall Wall Thermometer 15"